This year saw over 50 entries for the Awards across all categories - our highest ever number of entries. 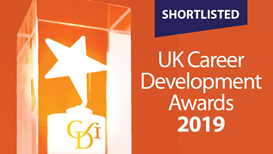 The winners in each category will be announced at the UK Career Development Awards on Wednesday 6 March at The Queens Hotel, Leeds. Kirsteen Allison, Skills Development Scotland - Barriers to employment and training: what prevents training providers in Scotland from recruiting and supporting young disabled people?